In a few days time the autumn term at UCL begins along with the many classes and practicals which take place in the Grant Museum. In the first term of last year, the Grant Museum held 28 specimen-based practicals using 770 specimens. Over 1300 UCL students from various departments attended these practicals as part of their course work. 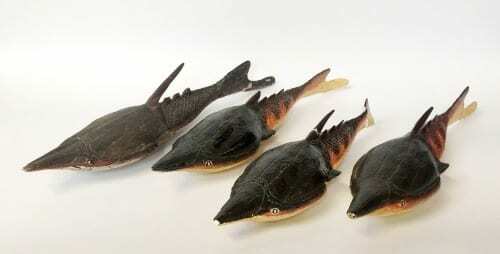 These four specimens are painted plaster models of the extinct jawless vertebrate fish Pteraspis. 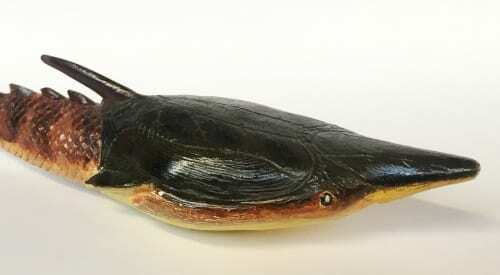 The models are about twice the size of the real animal (which was about 20cm long), but due to the fine modelling, give an accurate representation of what the animal looked like. Pteraspis (“wing shield”) had a heavy, bony shield made up of several independent plates that covered the anterior part of its body including stiff, wing-like protrusions over its gills. The rest of the body, including its flexible, hypocercal tail (lowest lobe is longest), was covered in small scales. With its pointed rostrum and spikes down its back, Pteraspis had a streamlined torpedo-like form which enabled it to be a capable swimmer. Pteraspis lived in the Pragian epoch of the Devonian period (about 413-405 million years ago) and fossils are found primarily in Great Britain and Belgium. The Grant Museum’s Pteraspis models were made by Vernon Edwards, who collaborated with scientists at the British Museum of Natural History during the 1920’s – 1950’s to make reconstructions of extinct animals and geological dioramas based upon the latest scientific evidence of the day. Edward’s models were very popular as a result of their combination of accuracy (based on actual specimens) and high artistic quality. They can be found in museums, universities and colleges around the world. 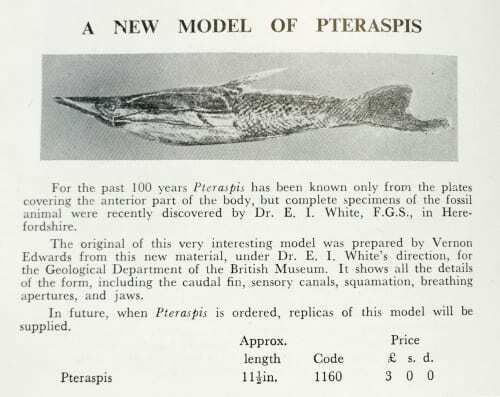 As indicated in the above catalogue description, this new model was based upon Dr. Errol Ivor White‘s discovery of the first complete specimens of Pteraspis. E.I. 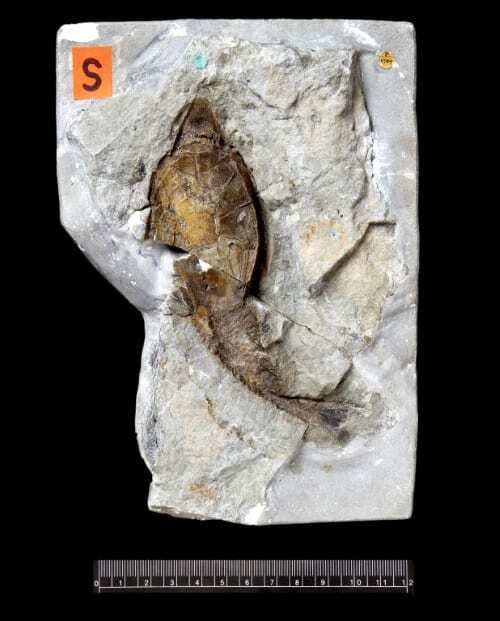 White, who would publish over 130 papers mainly on fossil fish during his long career, collected several specimens of Pteraspis from the Lower Old Red Sandstone formation at Wayne Herbert Quarry, Herefordshire in 1933. The principle specimen he collected would become the fossil upon which Vernon Edwards’ model was based. 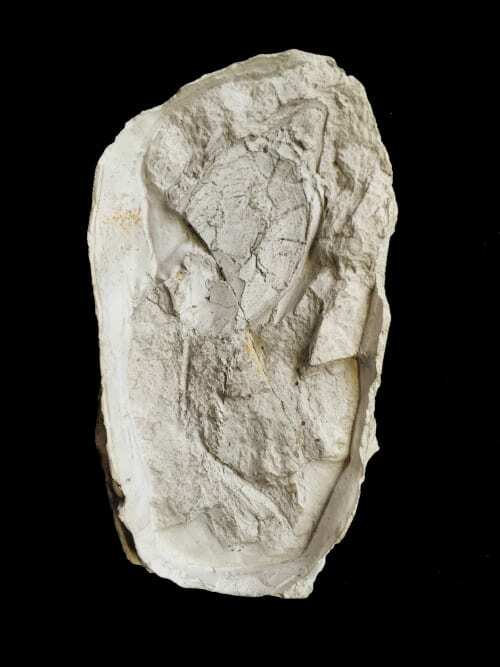 The original fossil became part of the British Museum (Natural History) collections (now known as specimen number PV P 16789) and was described by White in 1935 as Pteraspis rostrata var. toombsi (1). White named four other varieties from the new material with the comment that one of these could eventually be shown to be the typical form (2). In 1984 Alain Blieck redefined the species naming a new genus after White, Errivaspis (wayensis) for P. rostrata var. waynensis and it is by this name that P 16789 is now known (3). The Grant Museum does have several Pteraspis fossils of head shields but the only complete specimens are the four Vernon Edwards models and the plaster cast of PV P 16789. The plaster cast (LDUCZ-V1160) appears to be a first or early generation cast which would date it to the mid 1930’s (which, although the date of entry is not listed in the Grant Museum’s Fossil Vertebrate Catalogue nor the later Fossil Fish Catalogue, is about right considering it’s low original catalogue numbers and other non-absolute dating methods). Interestingly, the Fossil Fish Catalogue card for V1160 indicates that the cast was used in practicals – just like the models are used today.